Team Create, from Israel, has been named winner of the Delta Innovation Award 2018. The company produces “Notify”, a phone holder for cars that prevents receiving notifications while driving. 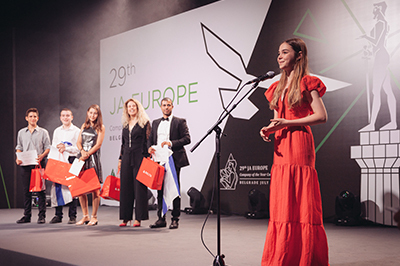 39 national delegations representing 200 young people competed for this award during the JA Europe Company of the Year Competition in Belgrade, Serbia, on 18 July 2018. Junior Achievement Europe has announced that Create, a student-run company from Israel has won the first ever Delta Innovation Award. Create won the Delta Air Lines award after demonstrating excellence in a number of core areas. The judges, led by Shane Spyak, Delta’s Staff Vice President – Europe, Middle East, Africa and India Sales, cited their ability to develop an innovative yet user-friendly product that promotes safer driving. The students designed and manufactured an in-car mobile phone holder that blocks distracting notifications being received, such as SMS messages, while enabling the use of navigation systems. Other judges included Shane Spyak’s Delta Air Lines colleagues Maggie Butler, Project Manager & Sales Development and Thomas Brandt, Country Sales Manager Germany Switzerland and Austria. “It’s amazing, we’re very excited to have won the Delta Innovation Award. With our product Notify, we wanted to address this issue of texting while driving and increase safety. The support of companies like Delta Air Lines helps young people like us to believe in themselves and realize that they can make a change in the world and be recognized for their innovation,” shared Aya Haimovich, CEO of Create. All the students who pitched their products at the JA Europe Company of the Year Competition have been taking part in JA’s flagship Company Programme over the past academic year. The Company Programme empowers young people to set up and run a real business, making all the decisions from deciding on the company name and product, to creating a business plan, managing their finances and selling their products. More than 340,000 young people took part in the programme this academic year creating over 30,000 mini-companies. Through a partnership with Junior Achievement that now spans over 30 chapters on four continents (North America, South America, Europe, and Africa), Delta helps ignite an educational spark in more than 810,000 students each year.